So wrote the eminent psychologist Mihaly Csikszentmihalyi (Mee-hy Cheek-sent-mə-hy-ee) in 1989, on the very brink of what IT Idealists might have heralded as a leisure-time revolution: the internet and its all-you-can-eat smorgasbord of attention-grabbing content. And yet, if anything, Csikszentmihalyi’s research, shows that frittered away leisure-time is more dislocating, and inner-disordering for the psyche than an onerous job. Mihaly calls this state of aimless apprehensiveness ‘psychic entropy’, and his findings are even more pertinent today than they were 25 years ago. This is because, 25 years later, we have a billion more options when it comes to splintering our free time and mental energies. Almost all of them involve the fracturing and dividing of attention and intention, which like eating crisps or salted peanuts, feels pleasant and moreish whilst doing so, but the final outcome is more often than not one of mental constipation, existential biliousness. Spend an hour or two on any social media platform, or even just a bit of aimless hyperlink chasing, and psychic entropy will soon take over your inner-world like a flesh-eating bacteria. 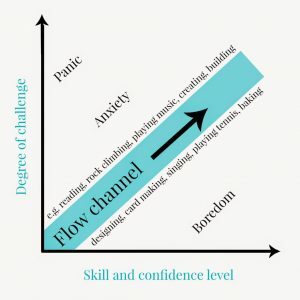 ￼ Some other components that appear to be important when it comes to creating flow for ourselves include: being clear what our goals are; getting immediate feedback from the activity itself in terms of how we’re doing, as well as losing ourselves and our sense of time whilst engaged in the optimal experience. Another criteria that seems to be key is that the activity should be autotelic: something that is intrinsically satisfying in and of itself (from auto ‘self’ + Greek telos ‘end’ ). Not done for the approval of others, or out of a sense of duty, but because one gains pleasure and flow in carrying it out. I used to think that writing was an autotelic activity for me, but I now realise this is not the case. I care too much about being read, or unread, and what you will think of me whilst reading, which creates an oppressive self-consciousness against which I’m always struggling with, the very opposite of flow. Whereas gardening is pure flow. So much so that I sometimes feel a little perplexed as to how satisfying it is without serving the kind of purposes I normally value in life. One of my clients who is feeling both adrift as well as stalled at the moment noted a brief but vital respite from his feelings of helplessness and hopelessness over the weekend whilst clipping his grandfather’s hedge. “If only all-the-other-stuff could be made to feel like that,” he sighed, recognising himself on the Experience Fluctuation Model as lurching from Anxiety to Worry, to Apathy, to Boredom and back again. 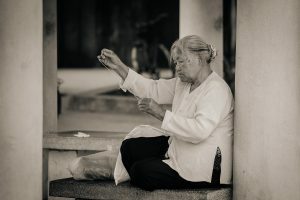 In so doing, there really is a good chance for increasing the likelihood of pleasure and meaning in our lives, wrapped up as it often is in the doing rather than the watch-me-doing performed for our own internal monitors and those in the social sphere.